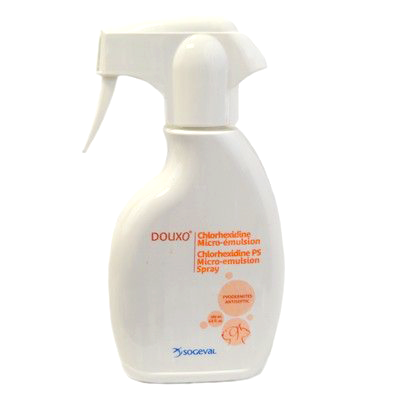 Douxo shampoos and spray products are foaming solutions with gentle hypoallergenic bases. If your dog or cat has a yeast, fungal, or bacterial issue, these cleansers are absolutely necessary. Your cat or dog will be left with a fresh clean tea fragrance scent afterwords and your pets fur coat will remain shiny and soft. Brush the pet against the natural fur line, and spray the product just by holding the pump 12 inches (30 cm) from the pet’s body, so as to spread out the emulsion all over the targeted area. The product will disperse naturally; do not over apply. Dosage: 1 spray per 10 lbs (5 kg). The number of sprays can be doubled for long-haired dogs. Puried Water, Chlorhexidine Digluconate 20%, Hexyl Laurate, Natural Glycerin Codex, Emulgade SEV, Emulgin B2, PCA Ethyl Cocoyl Arginate, Potassium Sorbate, Phytosphingosine Salicyloyl, Micropearl Sodium Hydroxide.